I wish I could say that I've been doing a lot of exciting things in the past couple of months but really, that couldn't be further from the truth. 90% of my time has been spent trying to keep up with University work, juggling work and my blog and trying to make sure that I don't go insane. However, Josh and I did manage to book Dear Evan Hansen tickets for November which I am really excited about because I was so desperate for tickets and I had convinced myself that I wouldn't get them because well, I don't have the best luck. As well as this, my mother and I have also booked to go to Rome for a few days at the beginning of September! I've visited a few places in Italy but I've never been to Rome so I'm really looking forward to that as it'll definitely be needed in between moving into our house and starting my third year at University. However, my mother has only just realised that this holiday means a few days of her being my personal photographer and I don't think she is too keen on the idea (oops). Then, University life has been busy (and stressful), to say the least. Admittedly, I didn't go to as many lectures as I should have in the past term but the way I see it, we all know I'm going to catch up so, if I'm really not feeling going to lectures one day, I shouldn't force myself to. However, it has definitely felt like one thing after another. One of the most stressful things in term two was my Cognition Practical module, where we have to work in groups to design a cognitive experiment, run it and write up a report etc. Group work is something that I have always struggled with and I found it particularly anxiety-inducing this time around. Thus, it's safe to say that I'm definitely glad that it's over - even if I do have to write a 3000-word report which is due in a few weeks that I've barely started because I have no idea what I'm doing. I've definitely found my modules this term really hard and I'm worried about the exams but equally, I am so pleased that the term is over and I only have these three exams and one piece of coursework (why am I making it sound as though it's nothing?) to go before I can have a few months off from Uni work. This brings me on to my current living situation. I'm kinda regretting not moving into a studio apartment or just commuting from home this year because I think that my living situation has a lot to do with the additional anxiety that I have been experiencing. I will be talking all about this and a variety of other things in my upcoming 'Second Year Truths' post but I've really struggled in student housing this year. The mess, the noise and not having my own space has really affected me and I honestly can't wait to live in my own place with Josh. On a slightly more trivial note, I no longer have red hair! Well, actually, in certain lights, my hair still looks kinda red but it's mostly brown now. I had red hair for over four years and then one day, I made the decision that I want a drastic change and it does feel weird waking up in the morning and not seeing my incredibly extra red hair BUT I think I like the change. It's still going to take a few more boxes of hair dye (doing it myself because my student budget does not allow me to pay out for a hairdresser) to get it how I want it but to be honest, I'm just glad that I didn't accidentally dye my hair green or something. Even if I did have a massive panic last weekend when I thought that I dyed it black (I had black hair years ago for a number of years and it was an absolute pain to get out so I really didn't want to have to endure that again). Moving on, still on the topic of appearance, I'm upping my efforts to lose weight. It's kinda hit me that if we want to get married in April 2021 and I don't want to get married looking like I do now, I need to be making more of an effort now to change it. 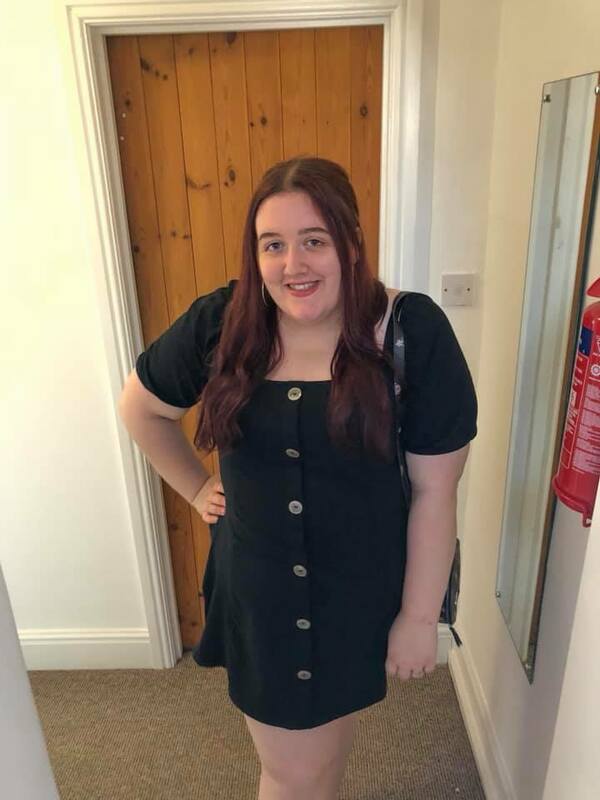 I haven't been comfortable with my body for years and this is something I discussed over in a recent Instagram post, but I want to lose around 5/6 stone and get back down to around a size 12/14. I'm trying to tell myself that this isn't unachievable but I know I need to keep up with eating good and exercising as much as I can. I'm also hoping to document this maybe monthly here and probably a lot more regularly on Instagram so that I can keep up the motivation. So, other than this, not much has happened. I have a month away from Exeter now for Easter so I'm splitting my time between Plymouth and Joshs. We also have a little midweek break booked at the end of the month to celebrate one year of being engaged - I can't believe it's been a year already! We have also started to really sort out moving in together in the Summer so that's pretty exciting (and stressful) too. How's your life been lately? Let me know below!